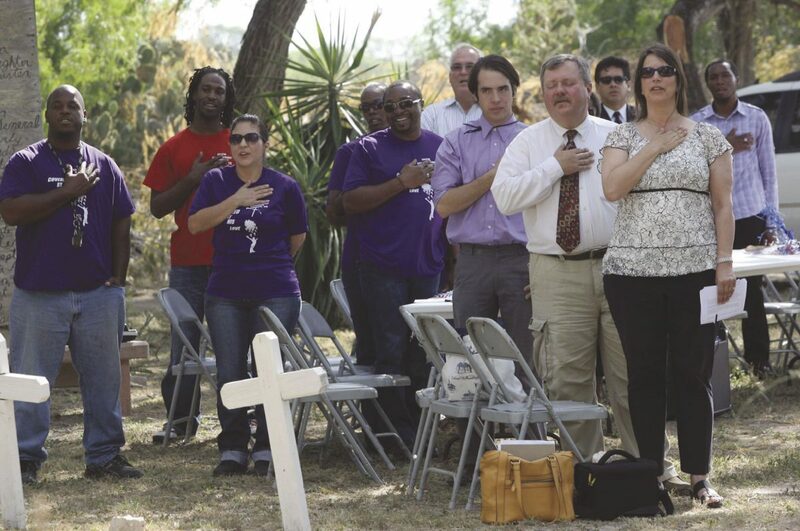 Several gather at the 22nd Annual Juneteenth Celebration at Restlawn Cemetery in Edinburg on Saturday, June 14, 2014. The Restlawn Cemetery is filled with stories that have never been told, of many people who wanted nothing more than freedom and came to the Rio Grande Valley because it was a safe haven. Those graves aren’t all just single graves. Some have two people. Others are what Edinburg Cultural Arts Manager Magdiel Castle calls mass graves. The City of Edinburg, the Dustin Michael Sekula Library and the Juneteenth Celebration committee are hoping some of those stories will be brought to life and saved for generations as the area celebrates Juneteenth from 8:30 a.m. until 10 p.m. Saturday at various places throughout the city. Juneteenth, officially recognized as June 19, is a holiday celebrated mainly by the African-American community remembering the announcement in 1864 of the abolition of slavery in Texas and the emancipation of those enslaved throughout the southern United States. The festivities will begin at 8:30 a.m. with a procession from the entrance to the cemetery, through the cabbage patch and to the section known as the black, or segregated, cemetery. Among those speaking include Kimbley Callis, whose dad was the founder of Juneteenth in the Rio Grande Valley, which began about 30 years ago according to Castle. Callis will be speaking on the historical perspective of Juneteenth in the Valley and her dad’s involvement. The procession and events at the cemetery are slated to conclude at 11 a.m. and will pick back up at the Dustin Michael Sekula Library, 1906 S. Closner Blvd. in Edinburg. In previous years, Juneteenth was recognized on a smaller scale, with just the library being used. Now, due to a larger committee that has worked to bring more recognition to the significant historical date, the city has expanded from just a recognition of the date to a full-fledged jubilee. “People will be able to migrate to the library, cool off and be involved in community discussion,” Castle said. There will be a panel discussion and stories from Callis and Sabrina Walker of the Edinburg Boys & Girls Club. They will reveal some interesting findings throughout their ancestry. There will also be a “soul food experience” throughout the library portion of the event as people of the community will bring some of their favorite foods to share with those in attendance — a soul food potluck. Panelists will include Maurice Welto, Rev. Nick Maddox, Dr. Letreise Winkfield, Neva Jackson and Daittra Lopez. Awards will also be given out for the Juneteenth Art Contest that has held an exhibit at the library. People are asked to bring their historical knowledge to the library where they will be collecting oral histories and scanning historical photos associated with Juneteenth and the Valley. The event will then take a break and resume at 5 p.m. on the County Courthouse grounds. There will be music, food, children’s activities, another flag raising and more. Events will run until 10 p.m.
For more information, call the library at (956) 383-6246.